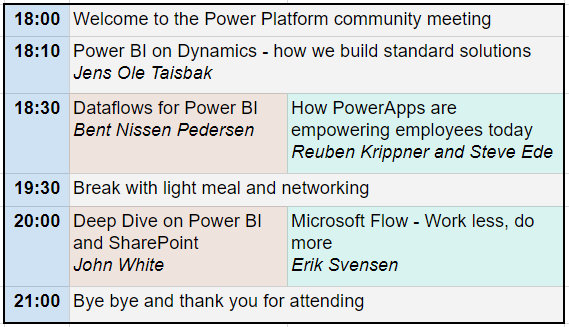 The first three speakers on the list is in Denmark because of the European SharePoint Conference (ESPC). We guarantee some very interesting sessions as the speakers are all some of the world’s leading experts. This demo rich session will explore many of the nuances involved with using a combination of Power BI and SharePoint. SharePoint data can be finicky to retrieve, and this session will show examples and suggest a few best practices for doing so. In addition, connecting Power BI to SharePoint opens up a whole new world for Excel. If it can be done with Power BI and SharePoint, this session will show you how. Get and overview of Dataflows and how it integrates data lake and ETL technology directly into Power BI to enable anyone with Power Query skills. Before diving into details we will go through the architecture and demonstrate the bigger picture for Dataflows in Power BI. We will go through how you can create, customize and manage data within the Power BI experience in a simpler way. Part of this will also be to go through Common Data Models which contains the business entities across your organisation. This will help your organisation simplifying modeling and is intended to prevent multiple definition for the same data. The Power Platform has grown up: we’ll rapidly take you through designing and building a modern solution from a canvas driven Field Worker App to a line of business solution. We will detail how these new products improve on the ones you are working to replace (such as Access and InfoPath) and how these new tools are built on a modern data platform (The Common Data Service) which leverages the full Microsoft stack ( O365, Business Apps, PowerBI & Azure integration). We’ll do this while weaving in some customer stories related to these scenarios and ensure we leave you with some great resources to take your PowerApps to the next level. Microsoft Flow helps non-developers and teams work smarter by automating processes across apps, services and data. In this session I will give an overview what Flow is and can do – and give real life demos of how I have used Flow to automate processes in building real life solutions.